The Group started in pre 1958 and was originally based at the now-demolished St Michael’s Church in Pine Grove before relocating to the then Congregational (now United Reformed) Church Hall in Queen’s Rd. It is still sponsored by the United Reformed Church and we meet at the Church Hall Thursdays for Cubs & Scouts, Fridays for Beavers. The Group scarf was originally plain maroon until the early 1970’s, when the white border was added by the then Leadership team. Yellow letters on Scout green. Approved by HQ on the 19th January 1989. Awarded after three Church attendances, it can be earned in any section and is worn on the back of the scarf. 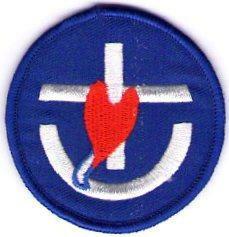 A red heart with a white tail outlined blue, superimposed on a white cross with a white arc at the base, all set on a blue circle.